My father's recent death was not beautiful, and neither were any of the other deaths I've witnessed of late. This has left me wondering about a better path. Death is not easy, to be sure, but these were made particularly painful by medical interventions — or perhaps I witnessed the confusion between saving a life and prolonging the process of dying. In Europe, there's a tradition of gathering to discuss important subjects — a café philo, for a philosophical café, or café scientifique, a scientific café, and now there are café mortel, or death cafés. A death café isn't an actual place; it's a temporary event in various locations, such as my home, complete with decorations and a cake with DEATH: THE FINAL FRONTIER scrawled on top. My gathering was comprised of spunky friends, all in our middle years, all of us healthy. As it turns out, this is the segment of population that most seems to care about shaping the end of a life. A Pew Research Center study found that less than half of people over 75 had given much thought to the end of their lives, and incredibly, only 22 percent of them had written down wishes for medical treatment. The same study, though, found a sharp increase in all adults putting something in writing (six of 10 of us), which indicates that percentage-wise, it's the slightly younger folks who are preparing now for their inevitable deaths. This does not surprise me. For the last 14 years, I've been one of the 28 million Americans currently helping someone die. Baby Boomers and Gen Xers are caught in an unprecedented tide of caretaking both children and parents (not to mention ourselves and our own aging bodies); we are the first generation to be caught in this particular kind of caregiving-and-slow-death crisis. With medical intervention and technological wizardry, we're forced to make decisions about procedures and medicines and ethics as never before. And we find ourselves without much guidance in a culture that's conflicted and confused about dying. Which is why we're willing to talk. At my Death Café, I encouraged us not to focus on the deaths we'd witnessed in the past, but rather to speak of the deaths that we want for ourselves in the future. Various results emerged. Half were afraid of the suffering that can precede death; half were afraid of death itself. Few of us had practiced death ("pretend this next breath is your last; what does that feel like? "), but all of us were convinced that doing so would only intensify and enlarge our lives. The zeitgeist of this new movement is just now gaining momentum, but I can feel its strength and power. An unprecedented 66 percent of Americans now think there are instances in which doctors should allow a patient to die instead of doing everything possible to save that patient's life. People would like to die — sometimes would like others to die — and this doesn't make us morbid or crazy or unethical or mean. No. We are merciful and kind. We are as moral as we are mortal. We just want to know how to gracefully do what is going to happen anyway. What lies ahead is unexplored territory, much like death itself, really. California recently passed "Death with Dignity" legislation, and the state representative in my hometown is reintroducing a similar bill in Colorado. Don't get me wrong; I am all for funding research, finding cures, and offering respite to caregivers. But it's also our ethical duty to try for a chin-up, heart-steady end. My father contracted pneumonia after 14 years of suffering with Alzheimer's. He was given antibiotics; I was not in a legal position to object, but I'd have asked for comfort care only –– not because I didn't love him, but because I loved him enough to want him to have as natural and relaxed a death as possible. Instead, I saw him grimace in pain and fear. I saw tubes and syringes and the sores on his body. I saw the family he'd worked so hard to create break apart under the pressure. I saw his blue eyes fade, and they taught me well: This could happen to you, too. 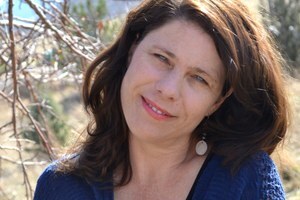 Laura Pritchett is a contributor to Writers on the Range, an opinion service of High Country News. She lives in rural Colorado and her novel, Stars Go Blue, is based on her experience with her father.